It doesn’t have to be summer in order to enjoy ice cream, right? :) Sadly, I do believe that I could eat ice cream every day without tiring of it! I have shared with you before some of my favorite ice cream fetishes, including low-calorie pomegranate ice cream cups from Eating Right (Safeway), and Julie’s Organic ice cream sandwiches (Whole Foods). But now I must share with you a new find on my list of must-have goodies for the freezer: Almond Dream ice cream sandwiches. These are soooo yummy, it’s unbelievable and they are only 100 little calories and 3 weight watchers points plus points. They also have a chocolate variety that I’m itching to try and I’ll let you know when I do, but for now, let’s discuss this delicious and good for you ice cream sandwich. What I really love about these little ice cream sandwiches is that they are very filling for the number of calories that they “cost”. They are also made from almond milk, so they are non-dairy, free from trans-fats and free from lactose or cholesterol. That means that you don’t have to feel guilty about indulging your love of ice cream – at least every now and again. One thing I like about foods that are pre-packaged in small portions is that they put you in control of how much you eat. Unlike a full-size ice cream bar, this sandwich is just the right size to fill that craving that you have for something sweet and creamy after dinner without overdoing it – or adding a lot of calories to your diet. Every dieter has a certain food or group of foods that seem to be their downfall. For me, it is usually comfort foods from my childhood, like ice cream and ice cream sandwiches. These little sandwiches make it easier for me to still enjoy those foods without adding to my waistline. I love almond milk, so I bet I'd be a fan of these ice cream sandwiches!! Nice! I'll have to look for these. Are they about the same size as the Skinny Cow icecream sandwiches? 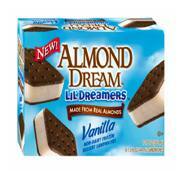 Almond Dream ice cream:How many WW points plus are per serving? i have seen a very excellent post. i really like this post.This post provides us very good knowledge about best online recipe . This is a very important post.